We look back at movies from 10, 20 or 30 years ago. Premise: An anthropomorphic duck from outer space is accidentally beamed to Cleveland, where he meets a girl, joins a band and fights a demon. Thirty years later? 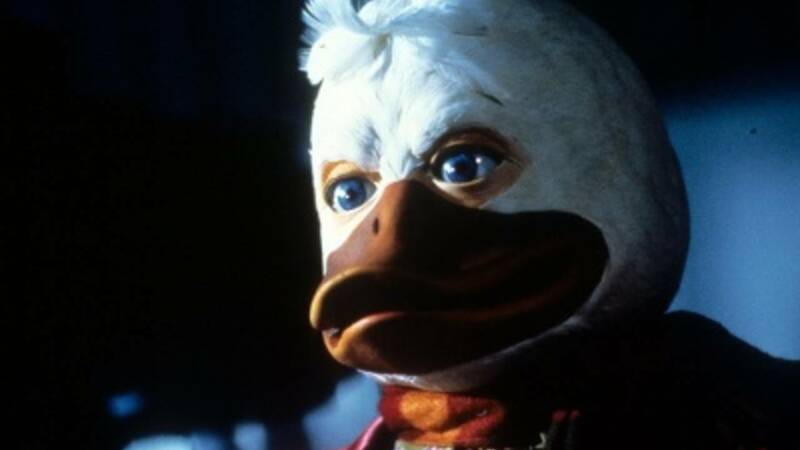 : There are many, many examples of George Lucas' poor judgment, but none really compares with "Howard the Duck," the infamous live-action adaptation of Steve Gerber's Marvel character. The movie (or at least this movie) wouldn't have been made without Lucas, who clearly didn't understand the satiric appeal of the comic. But the film's most-enduring quirk has to be how disturbing it is. This movie is PG, but Howard is a pervert. He reads Playduck magazine and sexually harasses co-workers. He lusts after Lea Thompson, and she lusts back. The amount of zoophilic sexual tension in this movie is still alarming -- a will they/won't they that makes you scream, "Don't! Stop!" Worldwide box office: $38 million, which was about what it cost to make. Dodged-a-bullet fact: Tori Amos auditioned (and was considered) for the role of Beverly before Lea Thompson got the role. Marvel fact: This was the first feature film based on a Marvel comic. Think about that.